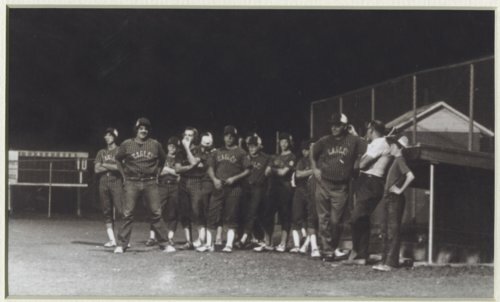 These photographs feature the 1975 American Legion Post 160 baseball team from Silver Lake, Kansas. The photos were taken during the American Legion's Class AA state baseball championship tournament held in Seneca. The Post 160 team won the state championship that year by defeating Lyndon in the title game. Members of the 1975 Post 160 team were: Bobby Bowers; Randy Brown; Alan Cunningham; Mark Elliott; Donald Francis; Brett Hamilton; Darrel Harden; Mike Kruger; Ken Martinek; Ronnie Martinek; Jon McCormick; Chuck Ross; Kevin Ward; Cecil Hamilton (manager and head coach); C.J. Hamilton (assistant coach); Kent Hamilton (assistant coach); and, David Boyd (batboy). Digital reproduction of the photos was accomplished through a joint project sponsored by the Kansas Historical Society and the Shawnee County Baseball Hall of Fame.